The Dutch Settlement on West Mountain began with two families—the Gutermuths and the Jordans—decided to come to this country. (The “Americanized names became Goodermote and Yerdon.) They were tired of their men being killed in countless wars, and having their fields plundered by invading armies,. Those who made and sold charcoal for their living, saw their forests burned by enemies. These people of Bavaria were simple, hard-working, clean-living Germans, who set sail in January 1834. After 80 days at sea, they arrived in New York City where they were met by other families who had come here earlier. The German families who met them were from the Capital District area. They brought the newcomers to Glass Lake in the town of Sand Lake. Primarily because of their desire to keep to themselves and to keep their social standards and customs intact, they moved to the high plateau between Berlin and Sand Lake. Soon they wrote back to Bavaria telling friends of this new country and others came. These new families included the Willibrants, Teals, and Schilzhowers. They were a closely-knit group and married within their own community. The community grew and so did the charcoal business. It was not until July of 1862—150 years ago—that they were able to worship in their own church. One of the money-raising events held each year was the Dutch Picnic which some still remember. Folks from Berlin, Stephentown, Taborton, and Sand Lake attended. There was plenty of delicious food, grab bags for the youngsters, Bingo, and round and square dancing enjoyed by young and old alike. In 1934, the Gutermuth and Jordan Memorial Stone was dedicated and still stands on the corner of Dutch Church and Taborton Road. Unfortunately, the church did not survive. Fire damaged the rear portion of the church in 1967, but it was quickly repaired. Then in October, 1968, the building was completely destroyed by fire. It was decided that it should be rebuilt in identical form to the original. Construction was started on November 5, 1968, but was halted by winter snows. 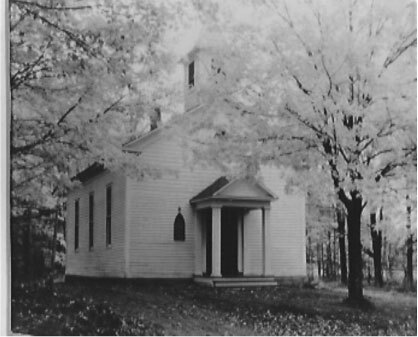 A. J. Goodermote and Sons of Berlin had the new church completed in the spring of 1969. Insurance covered the entire cost of rebuilding, and interior furnishings were all donated primarily by other churches. Services were still being held every other Sunday afternoon during the summer months. The church was again completely destroyed in 1982, and a memorial stone was placed on the site. The feeling was that being so isolated, the chance of another arsonist doing a dirty deed might well strike again. There will be a 150-year celebration this July. Watch the local papers for more information.